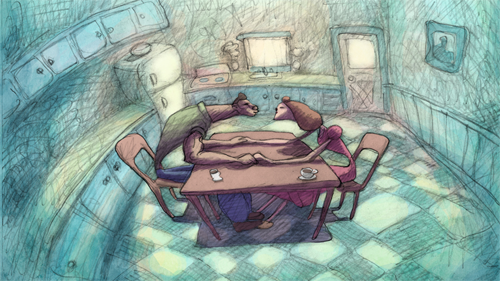 If Bill Plympton isn’t the strangest, most iconoclastic, bizarre, and brilliant animator of all time, we live in a very weird world. His instantly recognizable style takes caricature—the heart of all animation—to an extreme beyond anyone else working in features. Consider Jake—the irresistible hunk in Cheatin’. He appears to have a 60-inch chest and a six-inch waist. He looks as if the upper and lower parts of his body are connected by a thick rope. The love of his life, Ella, has lips so swollen you can’t imagine how she can talk. Not that we ever hear either of them talk. As with Plympton’s last feature, the brilliant Idiots and Angels, this is basically a silent film, told entirely in visuals, music, and occasional sound effects and grunts. The story is simple. Jake and Ella meet when he saves her life in a carnival bumper car ride. They fall in love, get married, and are so deeply in love that they can barely keep their clothes on. Other women throw themselves at Jake, but he’s not interested. Then one of these would-be seductresses tricks him into believing that Ella is cheating on him. He starts sleeping around, so Ella…at this point I should stop. But with Plympton, story is secondary. 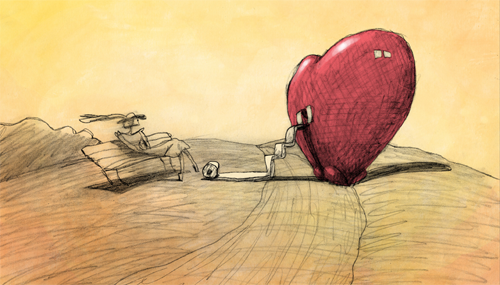 The real joy is in the surreal wit of his hand-drawn animation—drawn, I might add, with Plympton’s own hands. In the Plympton universe, everyone is ugly and misshapen–even characters whom the story paints as attractive. And Plympton shows his work, with visible pencil lines everywhere. The visuals reflect emotional states, not real ones. When Ella wonders why Jake seems angry and remote–they’re as far apart as they can be in the same bed–she reaches her hand out to him. And it keeps extending, many feet, as she tries to bridge the widening gap in the widening bed. Before the scene is over, the bed splits apart and his half floats away. It’s absurd, but it’s sad and touching. Often Plympton uses absurdity simply to get laughs, and he gets them. A hired assassin loads himself up with so many weapons that he can’t get through the door. A cop with both hands and both feet cuffed together, so that he can’t move any of them, still manages to chase his prey by hopping. The music, much of it familiar classical pieces, adds to the frivolity. When the soundtrack breaks into Verdi’s Libiamo Ne’lieti Calici aria (from La Traviata), Jake and Ella dance and move their lips to the Italian lyrics.